Chilesaurus diegosuareziGABRIEL LIOT. 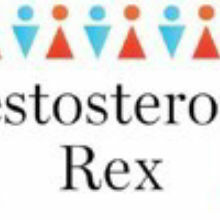 rex’s family was a little bigger than once thought. 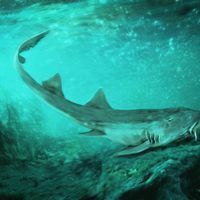 Scientists have described the fossilized skeletal remains of an herbivorous relative of the fearsome predator that lived 145 million years ago, publishing their results yesterday (April 27) in Nature. Diego Suarez, the seven-year-old son of two geologists, found the first specimens of the new species, dubbed Chilesaurus diegosuarezi, in southern Chile in 2010. Researchers subsequently unearthed more C. diegosuarezi fossils, including four complete skeletons, in the region. 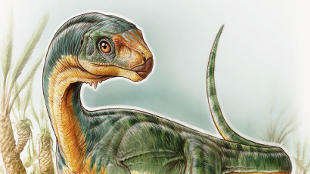 The discovery expands the carnivore-packed group of dinosaurs called theropods to include early plant-eaters. Some theropods evolved into herbivores, particularly around 66 million years ago. But the three-meter-long C. diegosuarezi is the first known example of an early theropod that appeared to consume plant matter as its main source of sustenance. 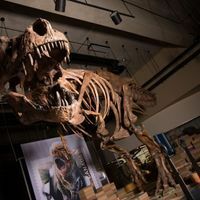 “We’re learning about the rules of dinosaur evolution,” Carthage College vertebrate paleontologist Thomas Carr, who was not involved in the study, told Live Science. C. diegosuarezi may be just the first representative of a long-hidden ecosystem that lies beneath the South American soil, according to lead author Fernando Novas of the Argentinian Museum of Natural Sciences. “What we’ve already discovered is just the tip of the iceberg,” he told National Geographic. “More specimens will appear, not just of Chilesaurus,” but also of the carnivores that likely preyed upon it.